Camilyn Leavitt has made a name for herself in the world of fashion and design. 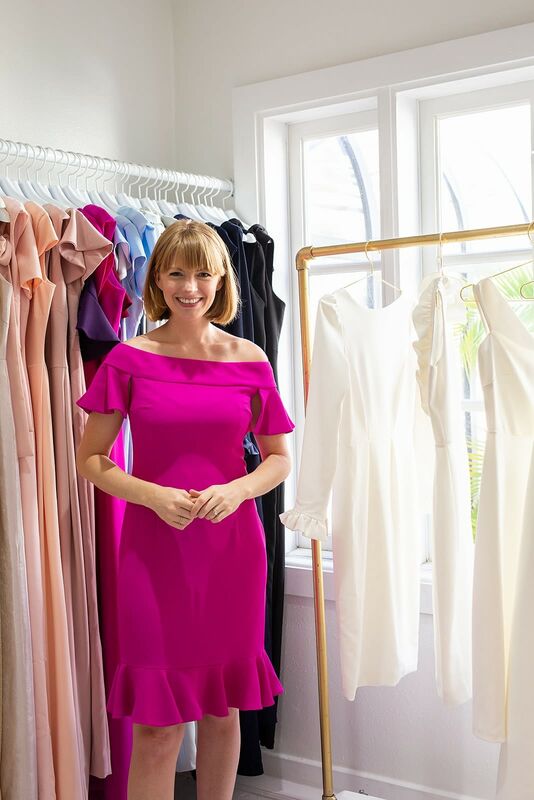 Her designs quickly became a favorite among brides looking for the perfect bridesmaid dresses and now, she’s designing dresses for the brides themselves. I stopped in Cami’s studio on Palm Avenue to take a look at the gowns in person (and even got to try one on! ), and to hear all about the new Camilyn Beth wedding gown collection. 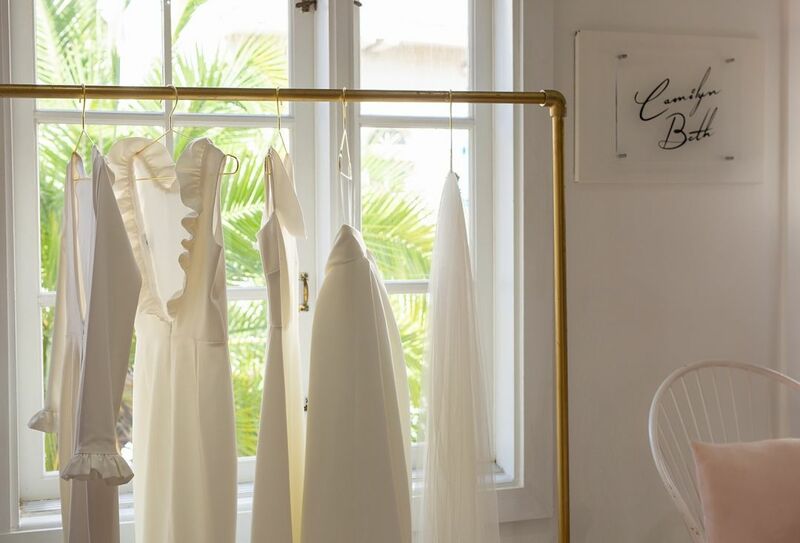 You started designing your own dresses to wear to weddings back in 2011 when you were invited to 16 weddings in one year—a year later you founded Camilyn Beth. 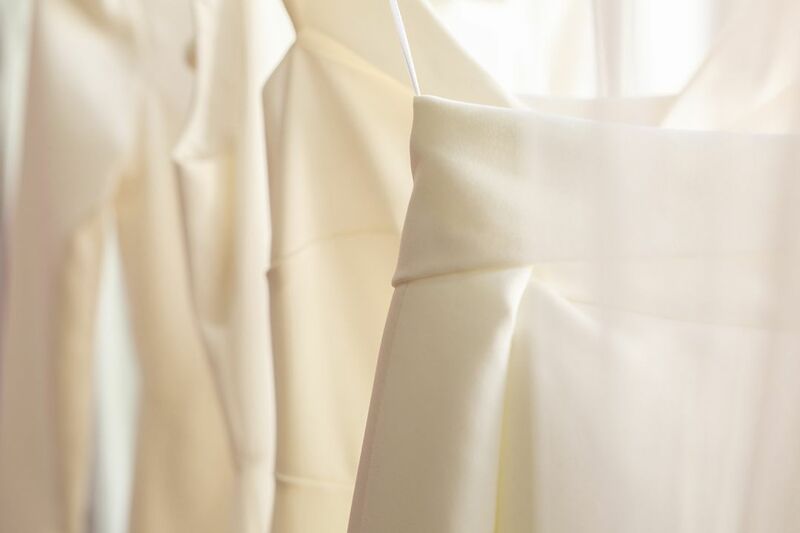 From there, your designs have expanded from guest of the wedding, to the bridal party, to 'little white dresses' for the bride-to-be and now... wedding gowns. What inspired you to start designing wedding gowns and adding that collection to Camilyn Beth? My line has always been inspired by personal life events. So, similar to how I got start started, there has been another wave of weddings this year (six instead of 16 this time), but instead of figuring out what I will be wearing—that's the easy part now—I have been asked to design six wedding gowns! After starting the design process with these brides, it dawned on me that this is what our Camilyn Beth customer is wanting as well. What experiences have helped guide your designs? And in turn helped you through the process of designing your first bridal collection? Once I started putting the bridal gown collection together, I kept asking myself this question: how can I make wedding gowns as classic and versatile as my ready to wear collection? That led me to create the two-piece wedding idea based around the core of Camilyn Beth—classic cocktail dresses that you can wear over and over again. How many gowns are in the collection and what makes them all different? Tell us about the fabrics. The fabrics I'm using is our standing stretch poly crepe for the body and satin d'hauteur for the overskirt. I always believe a dress should be as beautiful on the inside as it is the outside, so the dresses are always fully lined. Describe the bride you're designing for. I'm designing for the bride who ultimately wants a dress that is classic and feminine with subtle details that make the gown unique. I want our brides to feel like themselves, just more dressed up. You've described your wedding gowns as "classic dresses with statement skirts." They are the perfect reflection of how I see Camilyn Beth pieces—classic designs with a modern touch. Where do you find the inspiration for those pieces and maintaining that balance? When it comes to wedding gowns I draw inspiration from royal and presidential icons, from Jackie Kennedy to Meghan Markle. Mixing the two styles balances the old with the new. What advice do you have for brides buying gowns for their wedding? Make sure that you are choosing a style that is true to your personal style. Another creative and sentimental element to think about is how to incorporate a special family heirloom. For example, on one bride's gown we are lining the sleeves with fabric from a wedding gown passed down her family from the 1930s. For another bride, we are lining the pockets with fabric from her first date (which happens to be a Camilyn Beth cocktail dress!). I just love adding these little details, it actually makes me teary-eyed. Now that you are designing wedding gowns, I have to know—who designed your wedding gown and what was the style? I made my wedding gown! It was before I started Camilyn Beth. It was a fitted lace gown with small train. As far as new designs for Camilyn Beth, what's next? More options in bridal gowns! Are there any other new and exciting things happening in Camilyn Beth's future? Always new things in the works! We are adding more casual dresses to our ready-to wear line in the summer that have been very well received at markets.My favorite part of the business is designing, so there are always new things in the works! Where can you shop the Camilyn Beth wedding gown collection? At the Camilyn Beth studio in downtown Sarasota or online at camilynbeth.com.